‘Long Time Coming: A 1955 Baseball Story’ screening among the MLB All-Star events in D.C.
Fred L. Hicks and the 12 boys on his Pensacola Jaycee Little League Baseball team had their “hearts in their mouths.” Little more than 24 hours earlier on Aug. 6, 1955, the Little League headquarters directed the Florida state tournament supervisor to declare Hicks’ team the Northwest Florida region champions. The newly crowned squad was also informed it had to report to the San Juan Hotel in Orlando, Florida, by 8 p.m. the next day. Hicks and the parents of the boys worked overnight to get themselves together for the journey. All day the team drove from the westernmost part of the state to the dead center, and with 10 minutes left before the deadline, the Jaycees entered the city limits of Orlando. By the time Pensacola figured out where its lodging was, it was pulling into the parking lot by the skin of its teeth. On Aug. 9, 1955, the Jaycees took on the Orlando Kiwanis, marking the first time an all-black squad took on an all-white team in the South. It closely followed a controversy in South Carolina, where the all-black Charleston Cannon Street YMCA team won the state’s championship because the all-white units withdrew from the tournament in protest. Pensacola was playing the hometown favorite, but when the Jaycees walked into the ballpark, they did so to a rousing round of applause and a standing ovation, which Hicks said could’ve been heard all over Orange County. “This was all the evidence I needed to assure me we had been accepted and that these people were interested in making history,” he said. As Washington, D.C., welcomed the 89th Major League Baseball All-Star game to town, one of the events was a screening of The Edward E. Haddock, Jr. Family Foundation’s Long Time Coming: A 1955 Baseball Story, which recounted the trials and tribulations of that 1955 Pensacola Jaycees team, as well as the bond Pensacola and Orlando formed all these decades after the game. Kiwanis first baseman Stewart Hall, Jaycees shortstop Willie Robinson and Cincinnati Reds legend and Hall of Famer Joe Morgan attended the private viewing on Sunday. 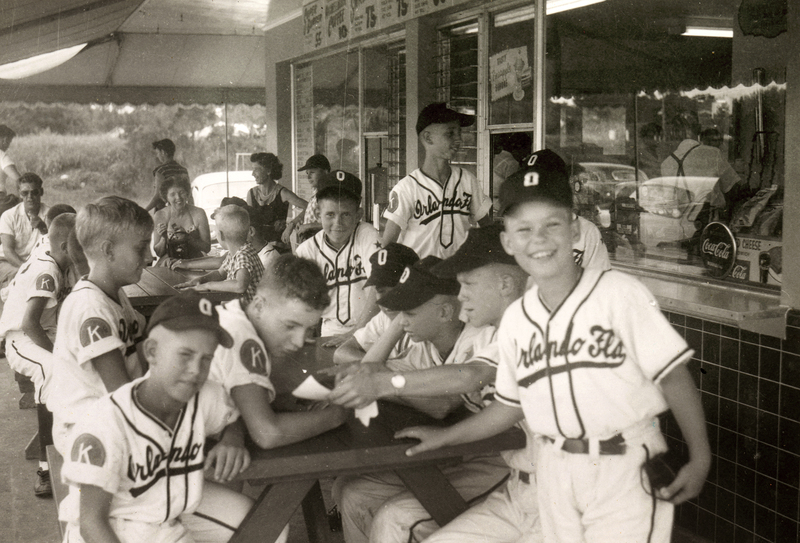 The Orlando Kiwanis Little League team in 1955. Morgan, who grew up at the same time as Robinson and Hall, said the movie made him introspective about how his being raised in California was such a privilege because the racial tension simply wasn’t the same. With all the divisiveness in the country right now, he explained that his hope was for people to watch the movie and go home to talk to their children and family members about what their takeaways were and how to avoid similar issues in the future. When Robinson and Stewart were approached about participating in the movie production, they were both skeptical. Robinson said production companies had approached him and his teammates about telling the story and it never materialized. Hall, in the introductory meeting, told the producers that if they were going to portray him and his teammates as racists or hostile to Pensacola, when that’s not how they treated the Jaycees, then he’d have nothing to do with the film. Pensacola’s road to its game against Orlando, which it would lose 5-0, was not smooth by any means. Raymond Riddles, the Little League district commissioner, attempted to rule the team ineligible by suggesting that it had been put together illegally. Peter J. McGovern, the president of Little League, stepped in and told Riddle any tournament that excluded the Jaycees would be ruled illegal. That didn’t stop Riddle, who proceeded with the illegal tournament and ultimately had to watch as the all-white teams would be forced to stay home because of his decision. 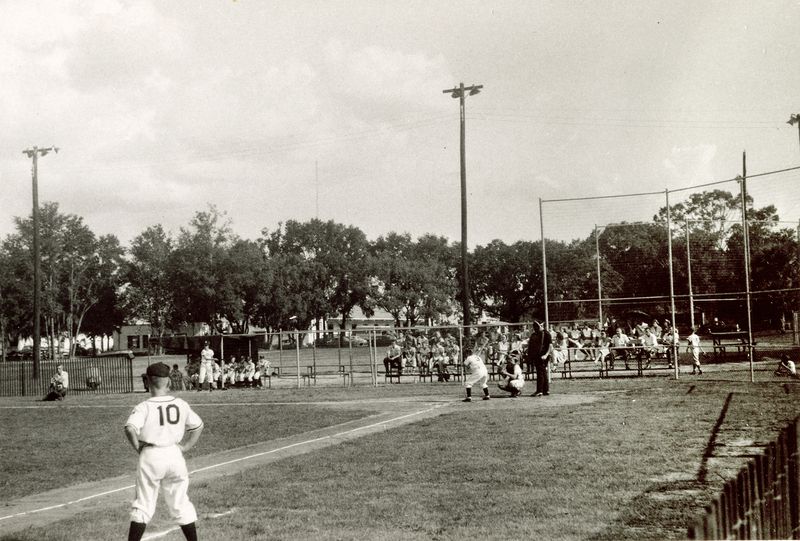 The historic game between the Pensacola Jaycees and Orlando Kiwanis at Lake Lorna Doone Park in 1955. Once teams arrived in Orlando, the question became would the teams from St. Petersburg, Miami and Orlando be willing to play ball with the all-black squad. The other three teams competing in the Florida Little League semifinals indicated they would play ball with whatever team made it to the final matchup, regardless of color. “All the time we were in the city, we were treated well and I don’t know any place we could have been treated better by both white and colored alike,” Hicks said. When he and his assistant coach walked into a meeting for which team would play which, they were met with handshakes. Pensacola ended up with a bye out of the draw. Hicks did not report any racism or tension in the managers’ meetings. The tournament director told the team its first game would be at 5 p.m. and to disregard any information contrary to that. Those who turned out for the game did so looking to witness a great matchup. Naturally, the fans were rooting for the Orlando team given where the game was played, but when Pensacola turned a good play on the field, applause would pour from the stands. Hicks also noted that the teams that had been eliminated from the tournament were openly rooting for the all-black unit. After the Jaycees’ loss, the teams exchanged pleasantries and Orlando’s coach came out more than halfway across the field to shake hands with Hicks. The Orlando Sentinel printed a photo of Hicks and his assistant coach on its front page the next day.